Held alongside the forum, the 20 + booth MINEX Expo will provide companies with the excellent venue for organising business presentations and holding meetings with potential and existing clients. The exhibition hall is located next to the main conference hall and coffee area offering excellent visibility. MINEX Expo has “open door” policy for visitors and media (no pre-registration required for visitors). Virtual stand hire on MinexAsia.com/2011 website – € 1100. Fee includes virtual booth hire for the period of 12 months on minexforum.com website, placement of marketing information (up to 5 MB), full page colour advertisement or 150 word company profile in Minex Central Asia 2011 catalogue, 30% discount off standard delegate fee. Exhibition booth hire from 7 am on 6 Aril till 6 pm on 7 April 2011 at the Radisson Astana Hotel (Forum venue), monochrome company name print on the front panel, hire of 0.7×0.7m square table, 2 chairs, 220 V electric socket. Short (150 words) exhibitor profile on MINEX Central Asia 2011 website and Forum’s catalogue. Delegate admission (pls. see terms below) to MINEX Gala Dinner 6 April. Additional delegate passes to Master Classes or Forum can be purchased at 30% off standard rate. Exhibitors who have booked exhibitor option 3 are entitled to a complimentary full page advert in the Forum’s catalogue. Hire of table, chair and small area for mobile exhibition stand (maximum width up to 1.3 m and height up to 2.5 m). 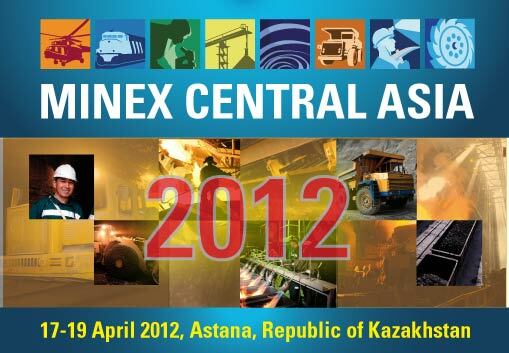 Listing of exhibitor’s profile (up to 150 words) on MINEX Central Asia 2011 website and in the Forum catalogue. One delegate ticket to MINEX Forum on 6-7 April 2011 (excludes Gala dinner). 15% off standard rate delegate rates. Booking confirmation and invoice: You will receive acknowledgement of your booking and invoice within 48 hours of sending your registration. Please call us on + 44 (0) 207 520 9341 in case you do not receive confirmation within stated period. Payment: Payments must be received in full before 30 March 2011. UK VAT is not applied to payments made to the UK account. Payments made to the account in Kazakhstan will be subject to Kazakh VAT, Bank commission charges and Exchange rates. All credit card payments are subject to 3% charge. AMEX card payments are not accepted. Booth cancelations: if received in writing before 25 March 2011 will be subject to administration charge of 5% of total amount. The full fees are payable in the event of cancelation after 25 March 2011. Delegate substitutions are welcome at any time (providing the delegate has Kazakh entry visa). Import of goods and customs clearance: Organisers of the MINEX Central Asia forum cannot take responsibility for receiving, customs clearance and goods storage. New Customs regulations have become effective in Kazakhstan in June 2010 (http://www.bbc.co.uk/news/10507601). Prior to arranging shipment exhibitors are strongly advised to seek professional advice on custom clearance and import regulations from the local Customs specialists. According to the statement issued by Asset Issekeshev, Vice Prime Minister and the Head of the Kazakhstan’s Ministry of Industry and Trade - MINT, published by Kazakh Today on October 6 2011 **, the results of the audit conducted by the Ministry, revealed a number of systemic problems in all segments of the country’s mining industry, including mineral reserves and resources, regulatory framework, infrastructure and personnel policy. In particular, as noted by MINT, mineral resources near several purpose built “mining towns”, are close to exhaustion and unless Kazakhstan takes prompt action, in 10 - 15 years the resource base of non-ferrous and precious metals will be exhausted. In addition, MINT notes that the law "On Subsoil and Subsoil Use" does not fully encourage mineral exploration and needs to be amended. The country's leadership hopes that the new regulatory changes will boost mineral exploration and attract junior and large mining companies to Kazakhstan. Another matter of concern is the lack of infrastructure. According to the survey Kazakhstan’s Mining industry lacks technical and technological expertise which cannot be offered by currently operating companies. The government believes that alongside modernisation of existing organisations, it will be crucial to create a mining research and engineering centre. Furthermore, geological exploration industry experiences acute shortage of qualified staff. To address this problem, several “Geology and Mining” faculties should be established at the leading Kazakh universities. Also, specialist training centres must be created and funded by the subsoil users. Asset Issekeshev also proposed to establish a Mining Advisory Council which would consist of respected experts. The Council should evaluate and determine training needs for the geological industry and in cooperation with the leading mining companies, will be taking part in shaping up new state policies in the mining sector. The head of MINT also called on creating greater transparency and accountability at the Committee for Geology and Subsoil Use, urging it to avoid inefficient and illegal use of budgetary funds. "The development of geology equals development of the regions, creating new industries and service companies. Therefore, there is an urgent need to solve all these problems. This means that the industry's major changes have to be systematic. It is necessary to develop a clear action plan, make changes in current legislation and adjust mining development program presently being reformed within the framework of the presidential industrial growth program. There is a need for coordinated work of all parties: the government agencies, businesses, and non-governmental organizations ", - concluded the Vice Prime Minister. "MINEX Central Asia” forum is organised with the aim of unlocking underexplored mineral potential of Kazakhstan and Central Asia and focuses on creating of new international partnerships and attracting investments in the development of mineral exploration and sustainable mining in the region. The organisers of "MINEX Central Asia 2012" commend the leadership of Kazakhstan, which celebrates this year its 20th independence anniversary, for taking proactive approach in resolving the issues faced by the mining industry. Forum’s technical committee comprised of 30 leading industry experts and chaired by Mr Jan Lewis, President of IOM3, will be preparing forum’s agenda in close cooperation with the leading mining companies, government agencies and foreign investors. Forum will address proposed changes in the reorganisation and further development of mining and geological industry of Kazakhstan. The forum will also offer platform for other Central Asia states for showcasing mining investment projects and innovative technologies for more efficient mineral exploration, extraction and processing.